As we approach one of the most critical elections in America’s history, we once again come face to face with our very great need. Yes, that is right, our rich and plentiful nation that is not use to lacking anything has a great need in this moment. I tell you friends the stench of death is hanging in the air. There is a sickness, called of sin, that lies over the land and because of it we are barreling a 1000 miles/hour down track that will lead us straight off a cliff. Friends, America has possibly never been more in need of divine intervention. Praise God that the Lord told us what to do when we found ourselves in these dire circumstance. On May 24, 2016 on our state capitol steps, we are blowing the trumpet and calling for a day of fasting and prayer. I encourage you to make this a priority. 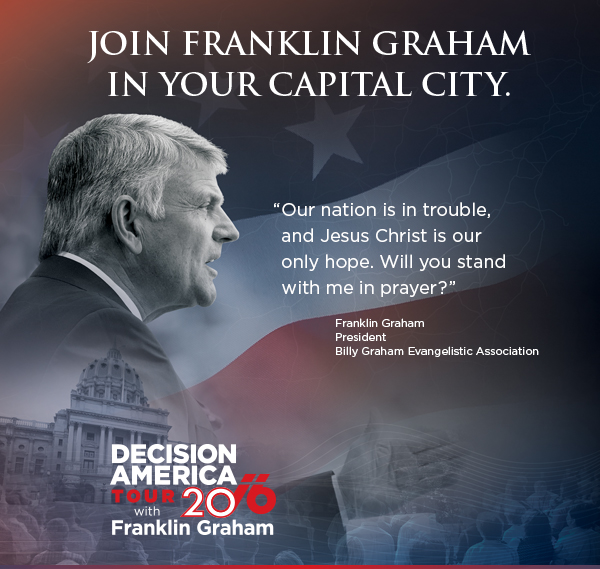 Franklin Graham, who is doing a 50 state prayer tour, will be with us in Pierre, SD. Franklin will be leading a 1 hour prayer rally on the front steps of our Capitol. There will also be prayer gatherings before and after the the Franklin Graham rally. This has the potential of being the largest prayer gathering the state of South Dakota has ever seen. A full schedule of events can be found in the column below. Plan now to bring your friends, family, and church. Get the word out by forwarding this email (a “Forward this email” feature is found in the footer). Join us, as we come together to acknowledge our very great need and call upon the Lord for His mercy and blessing. Looking to Jesus Christ for our Answers!